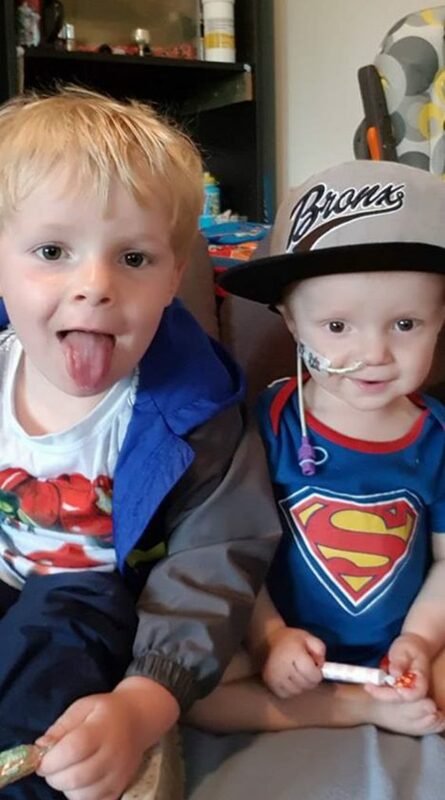 This brave toddler, who is battling a rare brain cancer, has received more than 300 cards from strangers determined to make the little lad’s second birthday one to remember. 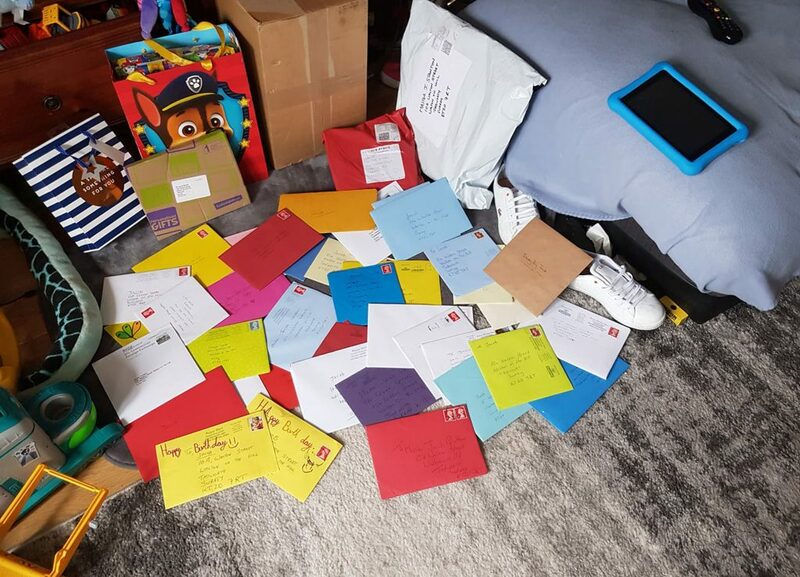 Parents-of-two Gemma Spicer, 28, and John Grattan, 27, were left stunned when hundreds of birthday cards for their son Jacob Spicer-Grattan, who turned two on August 16, started flooding through their letterbox. 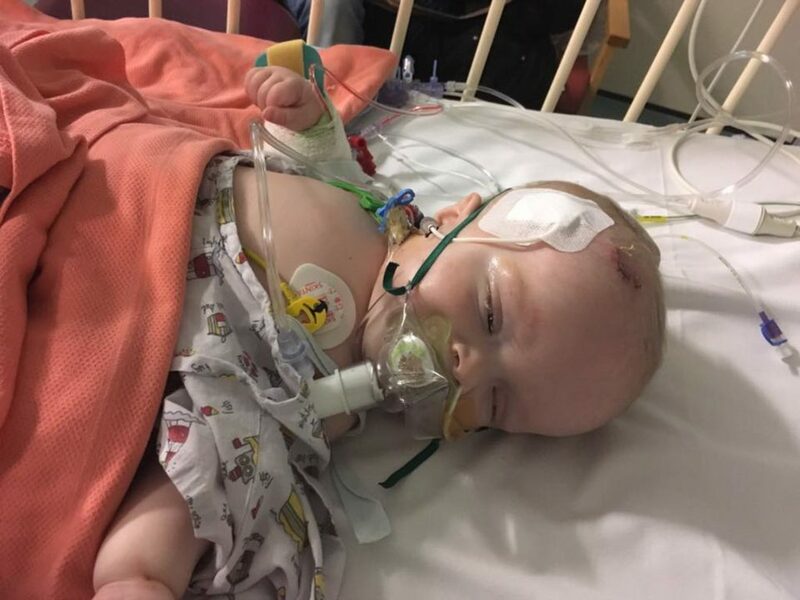 John’s sister Jade Barrett, 30, launched a Facebook appeal on August 13 for cards as a surprise for her nephew Jacob who suffers from choroid plexus carcinoma – a rare brain cancer that has stopped responding to chemotherapy. Jacob spent his birthday afternoon smiling from ear to ear among mountains of brightly coloured envelopes, which his brother Harley Spicer-Grattan, four, helped him open. The touching gesture from so many people all over the world has left nursery nurse Gemma and her fiancé John, a self-employed tradesman, overwhelmed by people’s generosity. “And it’s not just from people who know us or people in our village, they’ve come from all over the world. It’s completely overwhelming. “When I woke Jacob up on his birthday he kept saying ‘birthday, birthday’. He was so excited. We went for breakfast as a family and then to the park. “Then Jacob was worn out because it was only three days since he had his last chemo. He had a sleep and then in the afternoon he sat and opened the cards and Harley helped so he felt really special too. “There were so many handmade cards from children and some parents had written us beautiful letters. One dad who lost his son wrote to us to say his son was watching over Jacob from heaven. “So many people have written to us offering for us to visit their horses or their soft play centres. “John and I aren’t the type of people to ask for help. We would rather go without in life and piddle along but the generosity from everyone has been incredible. “One thing that almost everyone wrote in their cards was ‘keep on smiling’ because in every photo I ever take of Jacob he’s smiling – whether he’s in hospital or at home. Along with cards and offers of family days out, one anonymous stranger even had a star named after Jacob. 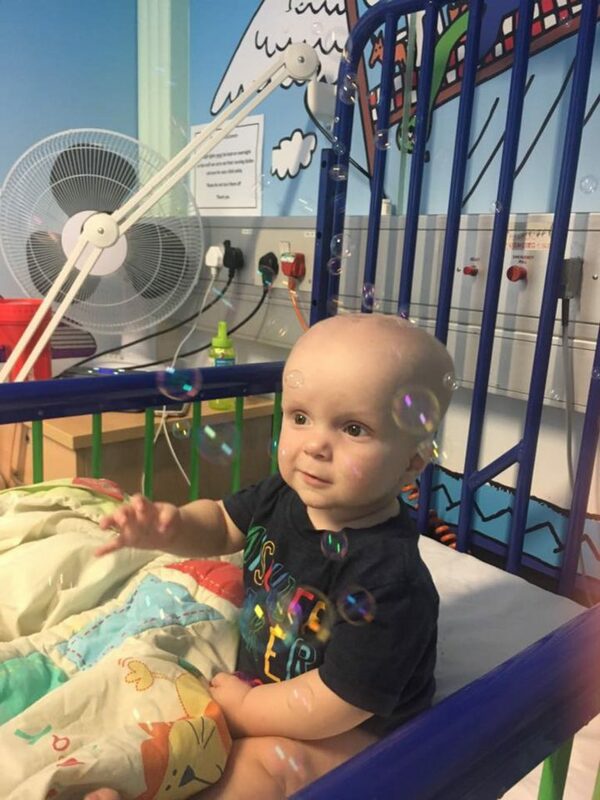 As the inspiring tot is due to go in for surgery on August 27 and was still recovering from chemotherapy, Jacob will have a proper birthday party on September 16 when he’s feeling better. 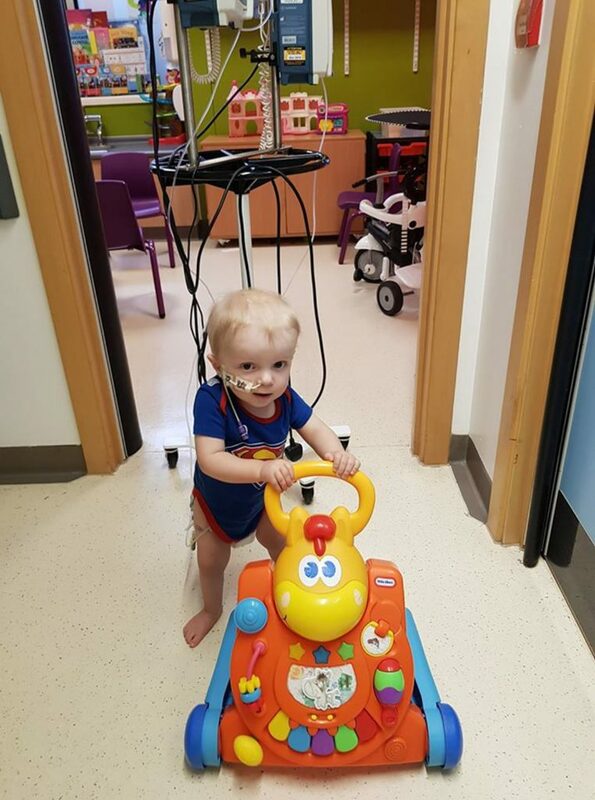 In his short life Jacob has undergone eight surgeries, 11 rounds of chemotherapy, around 20 blood transfusions and 15 platelet transfusions in a desperate bid to cure his cancer. 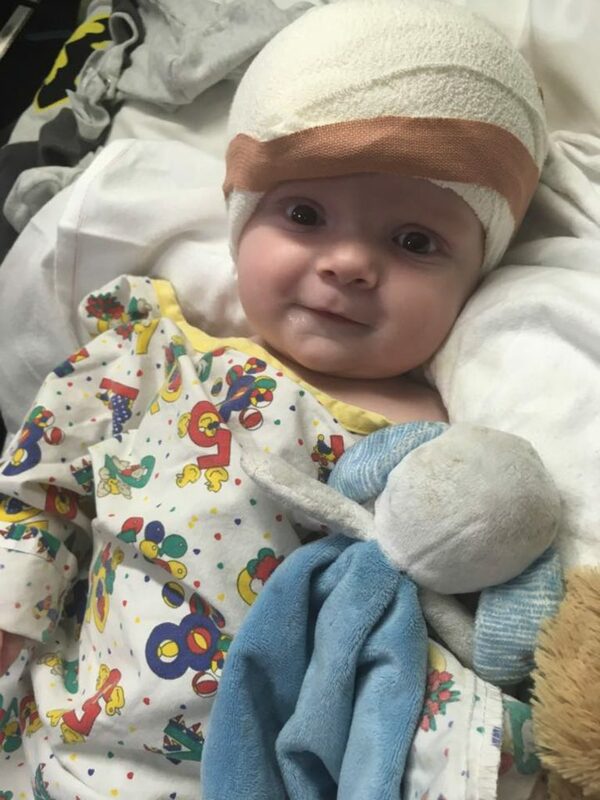 Gemma and John received Jacob’s devastating diagnosis in March 2017 after watching their baby boy endure a gruelling 10-hour surgery to remove a tumour that filled an entire ventricle of his brain. Gemma said: “Jacob was a happy and healthy baby from the day he was born but suddenly at six months he started to get really irritable. “Within half an hour we were being blue-lighted to St George’s in Tooting. “It all happened so fast. I think John and I were in shock, we were just speechless and crying. We had to call our families and they just couldn’t believe it. “Even then we never dreamed we were at the beginning of the rollercoaster ride that we have been on. “Jacob had surgery to have his shunt fitted and then a few days later he had surgery to remove the tumour. They managed to get 97 per cent of it out. “The wait for the biopsy results was only two weeks but it felt like a lifetime. “The consultant came in to explain it all to us but I think they try to use any word other than cancer to try to keep you from going into shock. I just asked outright ‘is it cancer?’ and he said ‘yes’. “To say it was devastating would be an understatement but little did we know that this was actually going to be the easy bit. But being back to normality was short-lived for the family when five more tumours suddenly appeared in Jacob’s brain in March this year. “I just remember thinking ‘not again’. I couldn’t understand why this was happening. Jacob’s cancer is very, very rare. I think it only affects five per cent of the population. Why were we in that five per cent? “The consultant told me and John to take time off work and focus on making memories as a family, it was heartbreaking. We haven’t been back to work since. “Jacob has undergone five more rounds of chemo but the tumours aren’t reacting at all. “And this time the chemo is so intense that he is really poorly. He has been getting ulcers in his mouth and they go down his digestive tract and into his bowel. “When he gets them he’s in so much pain he can’t eat or drink. It is horrific to see him go through that. “We are all physically and emotionally exhausted but waking up and seeing Jacob’s smile is a huge help. 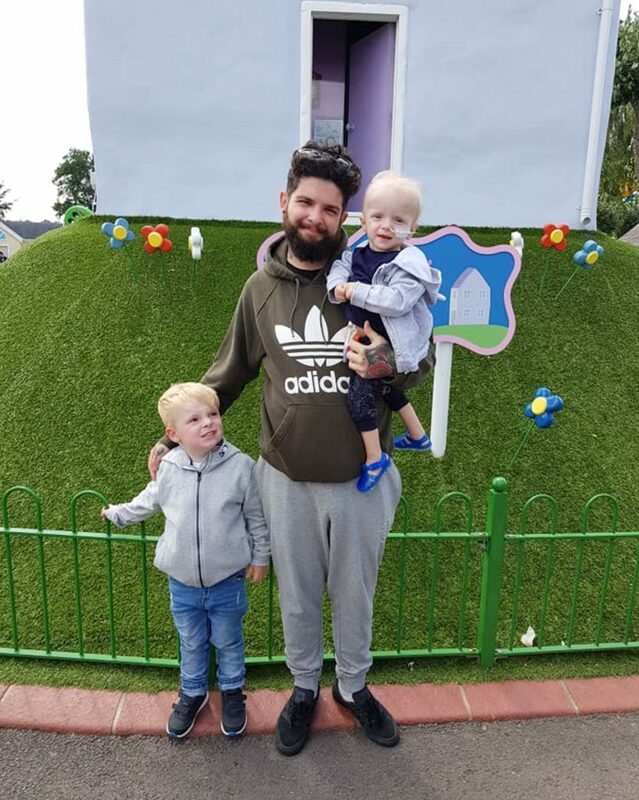 The family are also fundraising to take Jacob to Disney and any money they don’t use will be donated to supporting other families coping with brain cancer. FACT BOX: WHAT IS CHOROID PLEXUS CARCENOMA? • Choroid plexus carcinomas occur within the ventricles of the brain and can block the cerebro-spinal fluid from circulating and draining, causing pressure to build up in the skull. • Choroid plexus carcinoma’s occur most often in one year olds, where the signs of the raised intracranial pressure may be vomiting and lethargy (drowsiness) or your child being unable to look upwards. Their head size may also grow quickly. • Choroid plexus carcinomas are a high grade (grade 3), fast growing tumour. There is an association with the genetic condition, Li-Fraumeni syndrome.They are different from choroid plexus papillomas. • The first symptoms of a choroid plexus carcinoma may, therefore, be pressure headaches, particularly in the mornings. • Treatment involves removing as much of the tumour as possible followed by chemotherapy and, sometimes, radiotherapy. This partly depends on the age of the child, as health professionals try not to give radiotherapy to children under 3 years.